T.J. Dillashaw is no longer the UFC bantamweight champion, and that’s by choice. Dillashaw posted a statement on Instagram on Wednesday morning, announcing his decision to “voluntarily relinquish” his title in light of an adverse finding by the U.S. Anti-Doping Agency. Following Dillashaw’s statement, the USADA released a statement about the doping test. Henry Cejudo was Dillashaw’s opponent in his most recent fight. The two squared off at flyweight at UFC Fight Night 143 in January, and Dillashaw lost by TKO just 32 seconds into the first round. 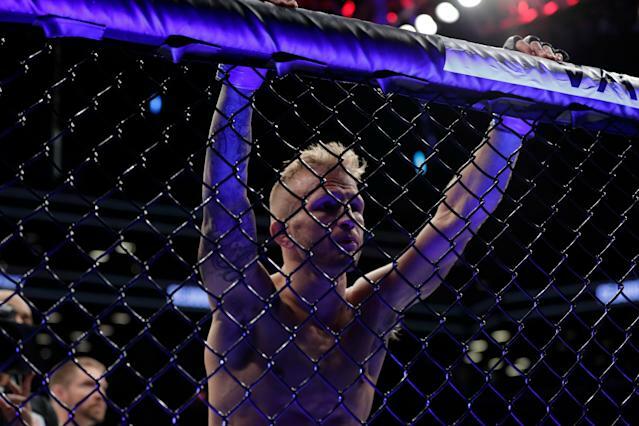 Dillashaw has held the bantamweight title twice, most recently after defeating Cody Garbrandt at UFC 217 in November 2017. He successfully defended it in a rematch against Garbrandt in August 2018. Dillashaw has never failed a doping test, but Garbrandt accused him of taking performance-enhancing drugs in the lead-up to their bout at UFC 217.